ePay made a free module for payment of invoices through Joomla. Using the module, your customers can easily pay their invoices online at your website. Get started right now: Download the module and follow the 4 simple steps below to accept invoice payments online. To try the ePay module, you need an ePay test account. A test account is free, and you can get yours in just a few minutes. When you get your account, you’ll also get a test merchant number, which is used for creating test payments. Please state in the comment field that you want a test account. You can disregard all prices. Whenever you’ve tested the module and are ready to accept real payments, we’ll upgrade your test account to a production account. This way you don’t have to create a new account, and you can keep all your settings. NB: Before installing the module, please make a backup of your website. First, download the module. If you use a version of Joomla that is older than 3.x, please download our old module. 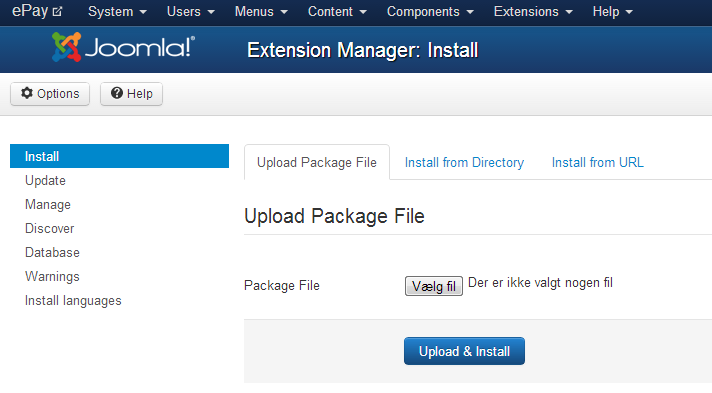 Go to the menu Extensions -> Extension Manager (please see image 1). Choose the file you just downloaded in “Upload Package File”, and press ‘Upload & Install’. Now the ePay module is installed, and you can find it via the menu Components -> ePay Payment Solutions. The invoice module is installed, but must be activated before use. Go to Components -> ePay Payment Solutions. Press the button ‘Options’ ('Parameters' in earlier versions) to edit the configuration of the module. Enter your merchant number in the field “Merchant number”. Your merchant number is either a test or production number, and you received it from ePay. Press ‘Save’ at the top of tha page to save the changes. Go to Menus -> Main Menu, and press ‘New’ in the right corner. Name the menu (e.g. ePay), and press ‘Save’ in the right corner. Now you can test the invoice module. 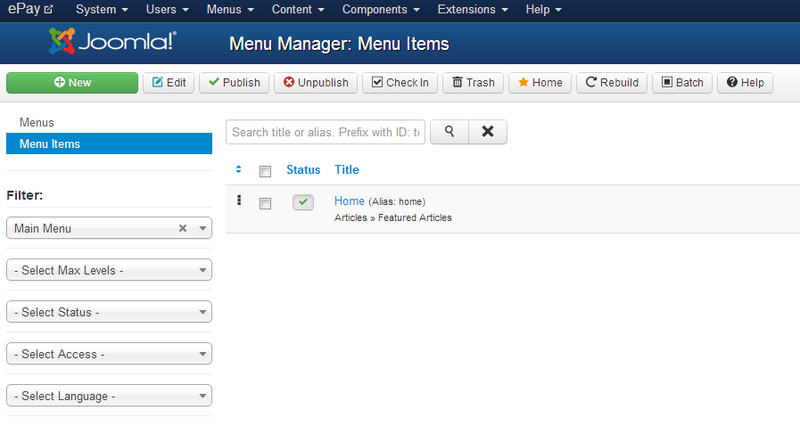 Go to the front page of your Joomla installation, and choose the menu you just created. Fill in your information, and press ‘Start payment’. Now the payment window will open. You can add your own company information and logo at the top of the window. Do this from your ePay administration in Settings -> Payment window. Your customer chooses between all the payment methods activated on your ePay account. When the customer has completed the payment and closed the payment window, he/she is sent to an order confirmation page.